For approximately three decades, the practice of urban stream restoration has been a focus of environmental efforts worldwide. Climate change and weather extremes increase the strain on urban streams, which exacerbates the impact of urban land use. As a result, erosion and sediment are negatively impacting stream stability, water quality, and habitat. During a recent International Erosion Control Association (IECA) Great Connections Conference, Ivo Lopez, Ph.D., PE, of Snyder & Associates, shared his urban stream restoration expertise with professionals from throughout the Midwest. The presentation, which highlighted tributary work within the Fourmile Creek Watershed, provided key insight into erosion control during construction. In the initial stages of stream restoration, Lopez says it’s important to foster strong communication and partnerships with property owners, contractors, city officials, and supporting agencies. Educating the public, leveraging support, securing funds, planning, and design takes time. Once the project has begun, unexpected challenges may arise. A proactive approach to effectively communicate and partner with all vested parties is crucial to overcoming challenges and achieving project success. Weather is unpredictable and can have a significant effect on construction progress. However, by planning and preparing, it’s possible to minimize the disturbance of the project site, which reduces weather-related risks that lead to erosion and sediment issues. These measures have been employed on a variety of projects including Fourmile Creek, Noelridge Park, and the Squaw Creek Bank Stabilization. 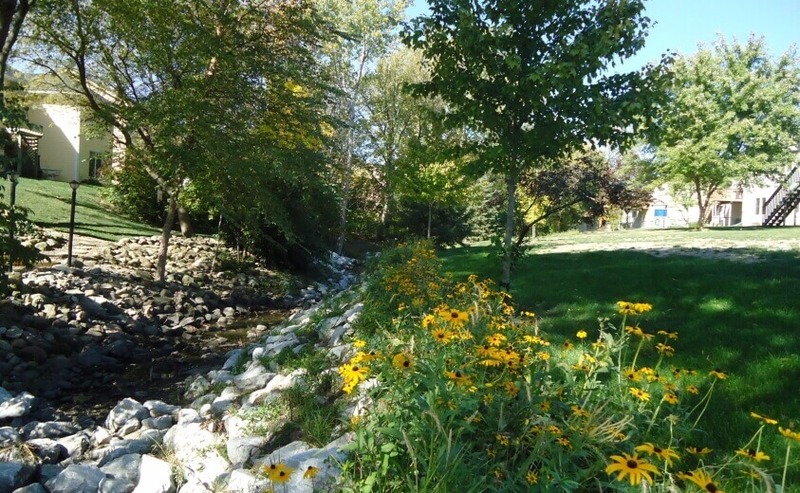 For additional information about erosion control and urban stream restoration, contact Ivo Lopez with Snyder & Associates.